Come check on the Progress Bar, but please don't drop by without an appointment. Scheduling one is quick and easy, and required. Progress Bar started as the Startup Port with the goal to create our own perfect office. 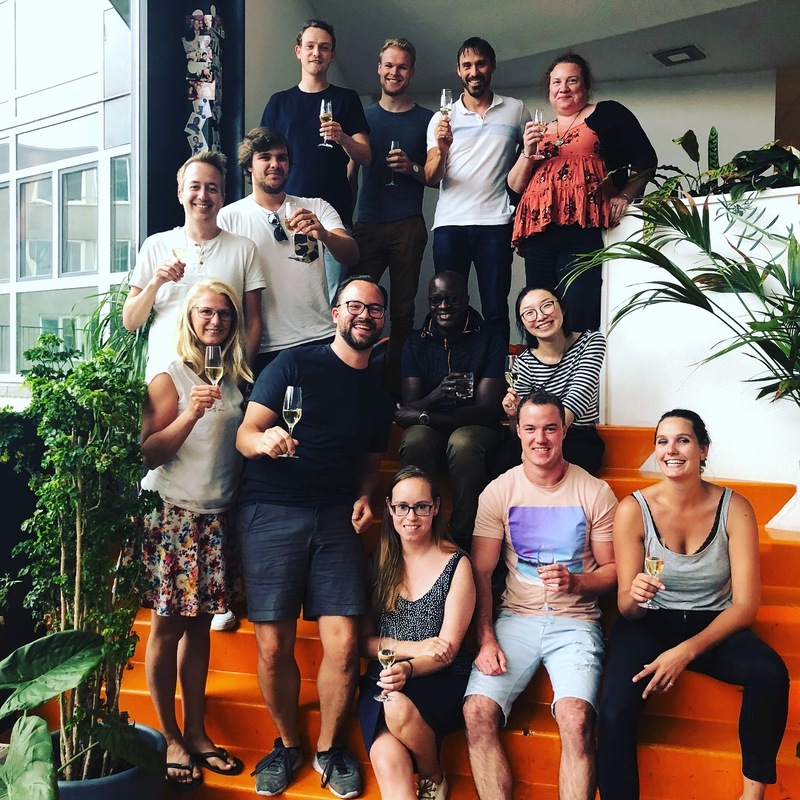 We were the first and only startup, and eventually the biggest co-working space in Rotterdam. Now, it’s a speak easy club of members who are constantly looking to develop themselves and want to achieve progress in emerging tech and methodologies. In the Progress Bar we achieve our goals and share our lessons learned and sub-sequential success with each other. Together we realise our personal ambitions and drive progress in our fields. You need a space that has everything you need to be productive and to generate results. You want to focus on what matters, not on how you’ll get lunch or if you brought cash for coffee. We need unrestricted space to focus on our core goals if we want to achieve them, but also understand that we can accelerate our progress if we share what works. We also acknowledge that celebrating success together is one of the greatest motivators. 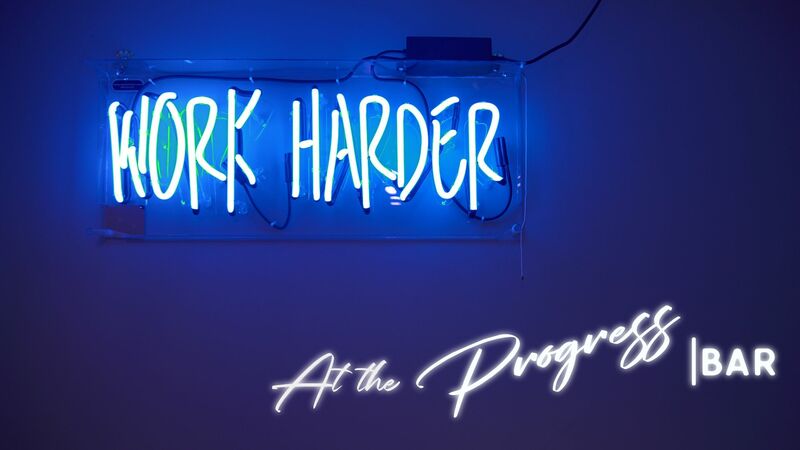 Progress Bar offers a no barrier approach to co-working, simply everything is included in your membership. From the obvious wifi and printing to your lunch and drinks, yes even those that facilitate your creative side. More importantly, Progress Bar offers you the ideal space to gather with like minded peers, so you can achieve progress together, faster. From the communal kitchen to the (standing) desks to lounge sets, different coffee machines and boiling water from the tap to an event space with 2 4k screens and 5.1 surround sound. We should have everything you need. If we do not have what you need, tell us and we’ll make it happen. Are you a member of Progress Bar Rotterdam? "Awesome place to work and meet likeminded people"
Progress Bar is an awesome place to work. I joined last december and it's the best decision for my business of 2018! The environment is very productive, but there is also a really relaxed and friendly vibe in the room. Also I really love the community aspect. There are regular drinks to meet new and interesting people; great to network, but also to share knowledge. There are some great growth hackers and marketeers here that helped me grow my business. The internet is good, but could be a little bit faster. Luckily they are working on it! Finally, Progress Bar is located very centrally so that's nice because I live in the city. I would definitely recommend to try it out. "Fantastic place and fantastic people!" I've been working here for a month and I must say that I loved everything about this place. There are a beautiful space where to work very relaxing, with a comfortable bench, a lot of beautiful plants, a good wifi connection and a ps4 to play with the other workers in the downtimes . The outside space is great but a bit too noisy. Food is good and it is always openly accessible. Furthermore it is very near to the city centre, just a few minutes away. People here are nice and you can learn a lot of new things from them. I'm new in Rotterdam, I moved from Colombia, and there I worked as an Innovation Consultant and Startup Mentor. When I arrived here, I was looking for a coworking space just to feel me again at home, I visited this coworking twice, There is a beautiful space where to work, with excellent wifi, comfortable types of furniture and mainly a great Host, he is caring for every detail and every request for the coworkers. The sad side of my story there, I couldn't stay that Friday to enjoy its cocktail night, but I hope to go back to enjoy the place and the Gin that I missed :). Really welcoming people, amazing place, full everything, cool neighbors. The only thing I missed it's to know more about the support for start-ups, workshops, events, etc. Leon talked about it and also some other coworkers, but I was there just for a day! So really looking forward to work back again. Ah, and the pictures do not make any justice to the actual place, it is 100 times better! . . . . . . . . . . . . . . . . . . . . . . . . . . . . . . . . Thank you for the kind words Jairo, you're welcome back anytime! 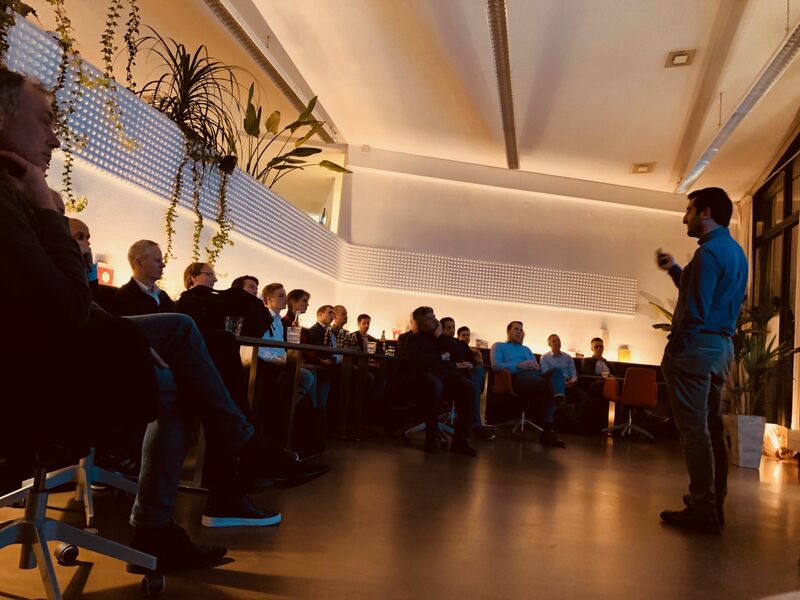 See you at our next Startup Academy? "Great and relaxing space to work"
It's always enjoyable to work at this coworking space. I've traveled around the world and worked in many different places, nothing matches the vibe at the Progress Bar. 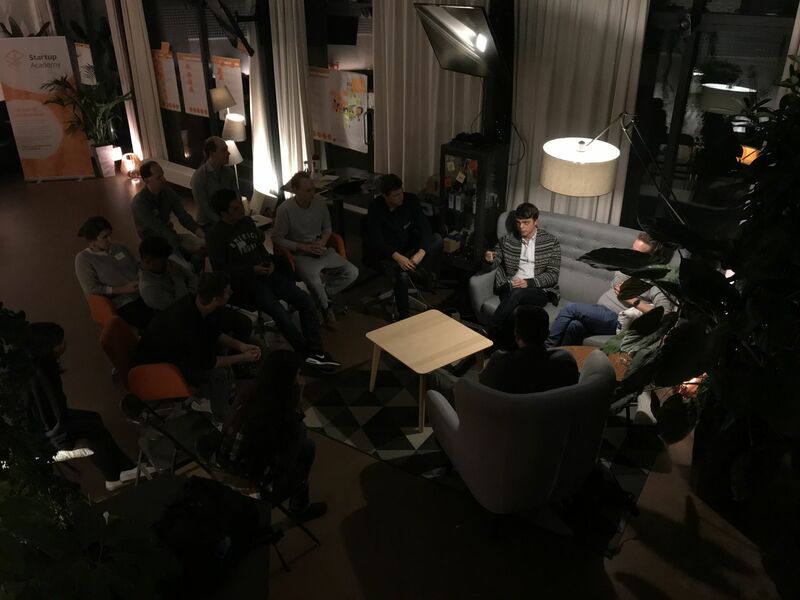 On occasion events and meetups are organized, which are open to all people that are members of the Progress Bar The space is ran by Leon Pals, he always goes out of his way to provide you with everything you need and to make sure the space is a great place to work for everyone. At the space I actually met Jeroen and we're planning to go mountainbiking together. Being able to work together and share hobbies is a great benefit. Thank you Bob, we hope you meet a lot more interesting people from our community! Not only is it an office in a perfect location, most importantly, it has a great ambience and great people. It's relatively quiet, though it's still possible to talk to people on the other side of the office. The reason I'm still renting a private desk after almost 2 years is because of that. People are very laid-back, easy to talk to, exchange ideas, hang out together after work hours, or have lunch together. It's the ideal space if you are self-employed or a small start-up and want to be part of a community. On top of that Leon and Simone organize lots of events for entrepreneurs to learn more about the startup process and share your experience with others. Highly recommended! 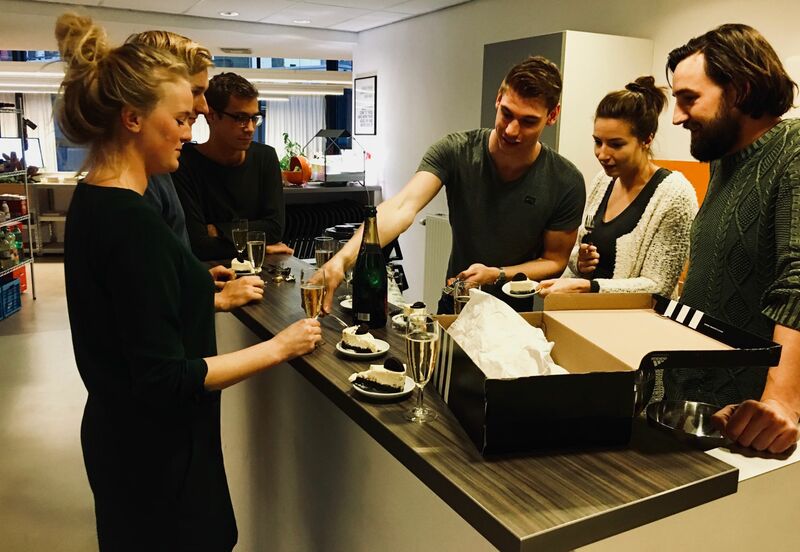 Thank you Jeroen, we hope to host you for at least another 2 years! Comfortable and clean place, very big, quiet rooms for meetings/calls, with room for all of the different working styles, very nice both inside and outside, has all the services a person needs to feel comfortable, spacious desks with all the necessary facilities, with big windows so there is enough light. There is a nice atmosphere inside, the team makes sure that everything is set up. The location is just a few minutes away from Blaak station, so it's easy to reach. It is the right place to work and think with stable and fast internet. Recently spent a weekend here, participating in a course, it was a great experience. Thank you Aurora, your comments are very much appreciated! Friendly , relaxed and creative environment . Great place , with a lot of light . It is equipped with everything: excellent Wi - Fi , very good food, well located within the city of Rotterdam , easily reachable ( also with the public transport , 5 min walk to Rotterdam Blaak, markthal, or to a stunning view on the river Maas ) In the office there are great people who you can talk with . It has all you need as a startup . In the weekends there are also some events which are great to attend if you're looking to expand your knowledge . Highly recommended ! "Incredible and supportive community "
Progress Bar is an amazing space for everyone that is in the startup world. They offer not only a beautiful and creative physical space, but the atmosphere really sets this place apart. Leon, Simone, and everyone renting a space there are very open. 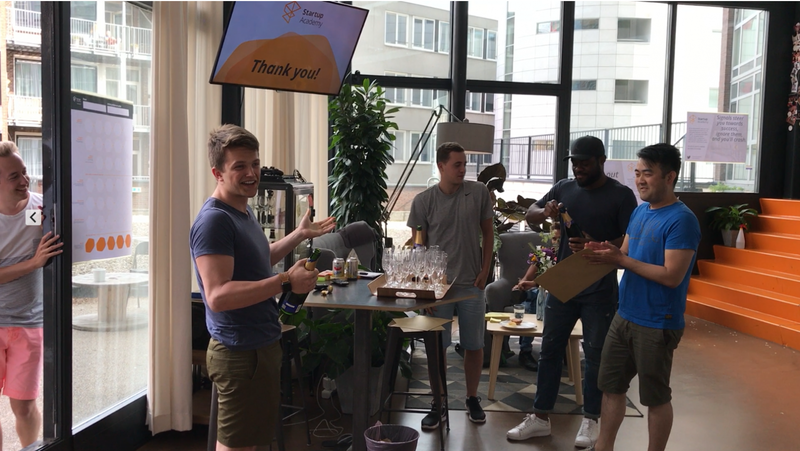 You can talk over ideas and work through challenges with the group here and when we want to share a success of ours, we celebrate together with champagne! They have a full kitchen, a large lounge for groups and private spots for calls and meetings, and a gorgeous patio to relax and think. Definitely recommend Progress Bar as the best co-working space in Rotterdam! Thank you for the kind words Lori! My favorite place in Rotterdam to work and connect. Leon, Simone and team provide a great atmosphere, and are a great gateway to the global startup ecosystem. 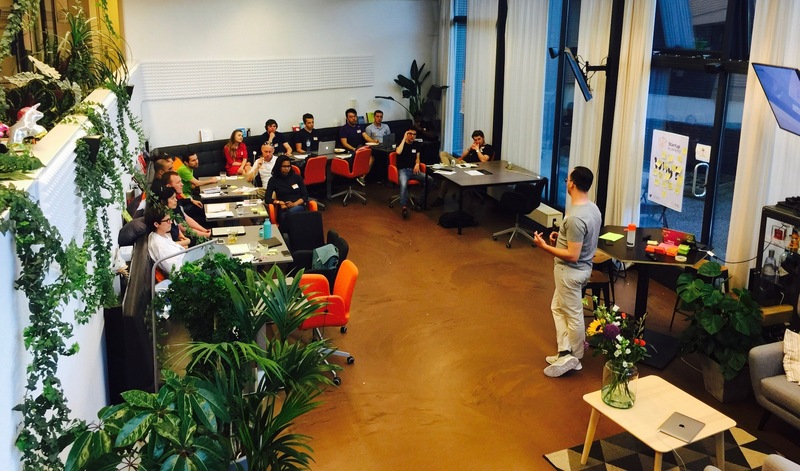 So, you're not only part of a co-working, but you join a community that extends way beyond vibrant Rotterdam. I enjoyed some real inspiring and change-making events, with key players in innovation and startups. If you like some fresh air, you can access some real nice outdoor area, a roof terrace. The location of progress bar is in central Rotterdam, accessibility by public transport and car are great. Don't look any further, here's you're new work-home! Thank you Rob, we're looking forward your next visit! "(Still) the best co-working space around!" We've been part of the Progress (& Startup Foundation) community for years now. Previously as tenants in the co-working space and now as regular visitors of all the different type of events they organise. 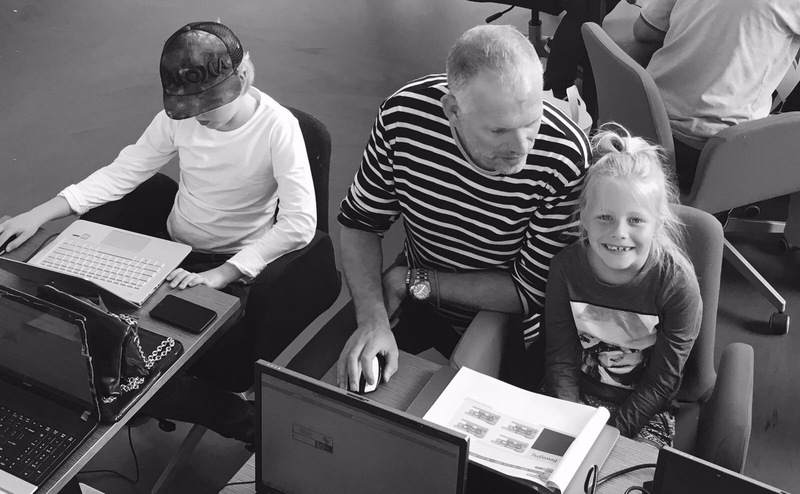 The fact that we (and many other (former) members) are still keen on being part of the community says a lot about how Leon and his team have managed to create one of the best spaces in the Benelux! 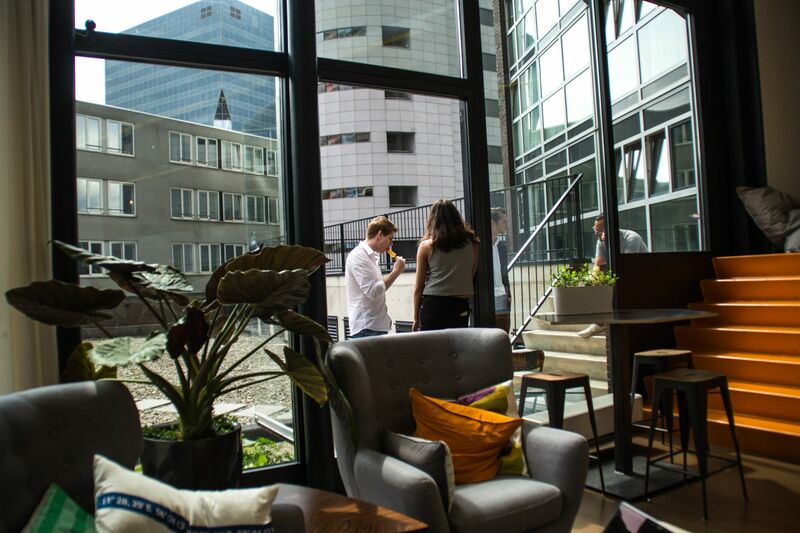 The working space itself has a cosy but focused atmosphere located in the heart of Rotterdam. 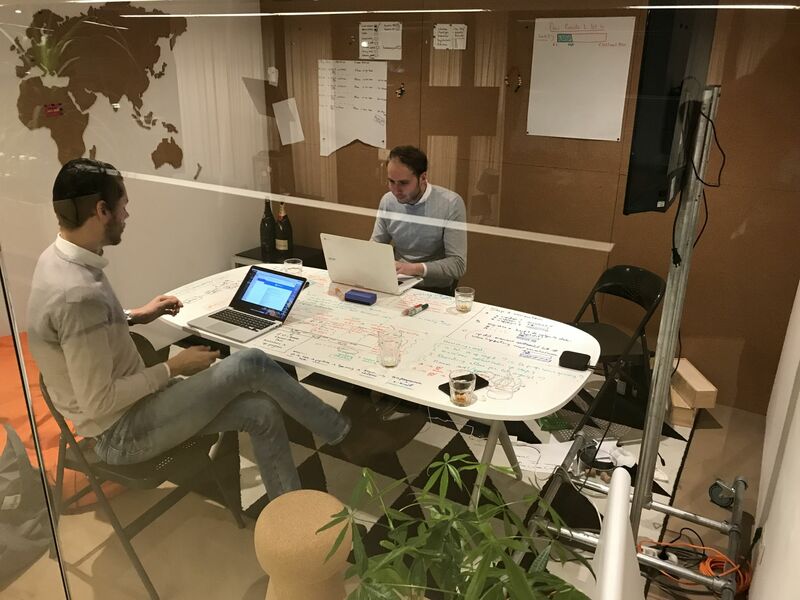 The team makes sure that everything is set up for you to perform your best: Spacious desks with all the necessary facilities (free coffee ;) ), open community spaces and the infamous office lunches (and drinks) where everyone joins! It sure feels like a second home. After about a few years in another city I return to a most heartwarming homecoming. The location with its terrace are superb, the facilities with comfy chairs and some standing work options are sublime and the people are about the best one could ever ask for. A good place to get called on your bullcrap and find genuine support. We enjoyed some drinks and food while learning from each other what has kept us going for the past years. Good to witness growth in a constantly shifting group of people that have at least 3 years of some sense of a common tradition or history. Thank you David, how about you start a chapter in Berlin? Beautiful and inspiring office with big windows so there is enough light. Nice mix of people from different backgrounds and with various skill sets. Great food. It's usually quiet so easy to concentrate on my own work. I like the option to sit at a real desk or to chill out and work downstairs where they have benches, plants and tables. I don't really know what else to say about this place but this website won't let me post this review until I write the required amount of words. Which I will finally reach in two or three more words..
"Nice cozy place to work"
The location is just a few minutes away from Blaak station and Markthall, making it super accessible from everywhere. The space is efficiently divided into open office space, couch working space and meeting rooms, and yes there is also a fully equipped kitchen. I feel super productive working here, good vibes helps with good flow of thoughts. Also have to mention there is door directly linked to a roof terrace/balcony with a lot of space. It feels really good to have fresh air once in a while without losing time to go outside of the building. Overall a really good working place to be! "Inspiring place to learn, think and work"
Recently spent a weekend here, participating in a course. It was a great experience in terms of location, outdoor access, light, plants, coffee and down to earth people. It's a place where real work gets done, with enough room for all of the different working styles that people have. I would happily come here again to work ! It also has a great location in terms of transit, bike access and proximity to the Markthall and the public library. This doesn't feel like a fraternity house. It feels welcoming and inclusive. Next time, I am stacking the beanbags and I am going to do some solid reading - and just maybe take a nap! Thanks Caroline, you're always welcome to have a nap, it definitely helps you process all the great content available. "Hidden treasure in the heart of the city"
This is a real hidden treasure in the heart of Rotterdam. Within walking distance of major public transport hubs and some of the well-known sites in Rotterdam. It is a great place to work with stable and fast internet, comfortable seats and a great outdoor space. The plants in the office make the office feel like a greenhouse. What I truly love about this place is that it is not just a co-working space. Members help each other out and occasionally have a drink together. That is the purpose of the progress bar ;-). I would definitely recommend working here! 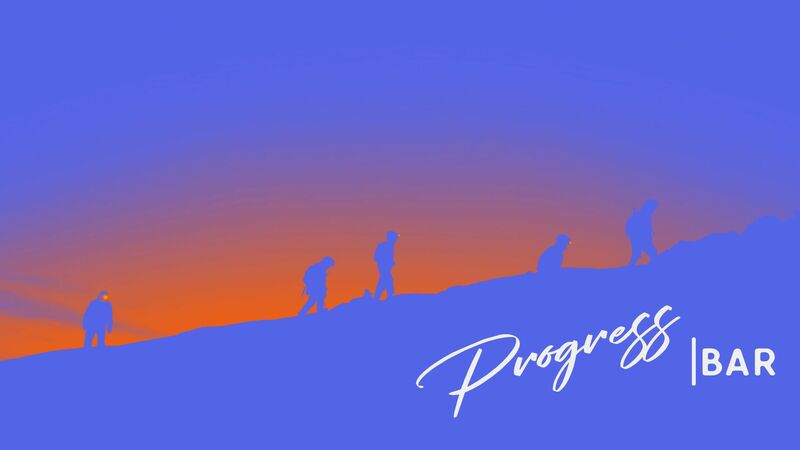 In the first stage of our company we were located @ the Progress Bar / Startup Foundation. With the help of the owner & the other members we were growing very fast. Still coming by every week! :) the location is in the centrum & provided with meeting spaces, a kitchen and a lovely roof terrace. You can acces it in 1 - 2 min from metro Beurs And Blaak (And the famous markthal. WiFi is good, food delicious and events almost every 2 - 3 weeks . Thanks for the good care And zeen u again! Cheers, Ruben . You're always welcome back Ruben! Absolutely amazing space, very big, quiet rooms for meetings/calls. Staff is super nice, and memberships are extremely reasonable. The location is very central, and easily accessible from all over Rotterdam. The included lunch is great, and everyone generally has a great time. Every Friday they have an open house/cocktails, Leon definitely knows how to make some fantastic drinks. The outside area is perfect for gatherings, eating lunch in the sun or taking calls when it's nice weather. The downstairs portion of the office has a lot of light, and they frequently have watch parties for sporting events and apple keynotes. Overall amazing space! Thanks Jeff, we thoroughly enjoy having you! "Co-working with an "at home" feeling"
If you want to co-work in a place where you are not just welcomed as a (membership) number but as a real person - this is your place! Good working environment ranging from a living room area to fixed and flexible desks and (small) meeting rooms. Wifi is excellent also. And the nice thing - around 12.30 -1 pm they all prepare and have lunch together (all ingredients are included in the co-working fee - unbelievable!!). So lunch is a good time to get advice or just vent your work success or frustrations - but this is also possible during other parts of the day. Don't worry - if you need to focus they will give you that space also! Best co-working place I have found in the Netherlands so far, especially for people engaged in start-ups. Because the place is not too big everyone knows everyone - which contributes to the "at home" feeling. The terrace outside and the location (close to Rotterdam Blaak train station and the Market Hall (both at 5 minutes walk) are bonuses. In summary: highly recommended! Thanks Heidi, we're looking forward to more of your stories when you get back! "A fantastic place to work "
Startup Port is a great place to work and has a friendly, relaxed and creative environment. The team working there are really warm and welcoming and the space has a great layout divided between a more formal and professional office space, private meeting rooms, an open kitchen area, a relaxed space for collaborating, pitching and presenting ideas as well as a cool terrace area which even has a hammock! This is the kind of space you dream about working when you decide to become an entrepreneur! And added bonus is the fact that the amazng Markthal is just 5mins away for loads of cheap and tasty lunch options. "Awesome coworking gem in Rotterdam"
Every time I walk into the front door of the Startup Port, I always feel right at home again. The Startup Port is a great place, where you feel right at home, the host is amazing, the events organised at the Startup Port are interesting so even while sometimes not working you can still keep on learning. 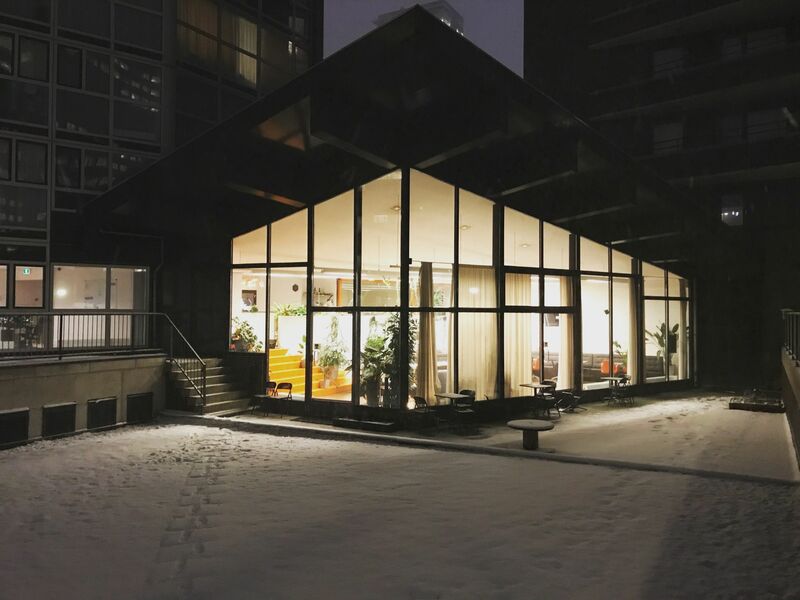 If you're based in Rotterdam or even just visiting and you need a place to work, don't think twice just hop on over to the Startup Port. In short a great place, that I have absolutely no problem recommending to anyone. So come on over and say hi to everyone. Every time you walk in it's like a family visit, and we don't mean the one where your mother in law visits, but your sweet aunt or uncle. Come again Hans. "The co-working space with the best community in Rotterdam"
I hired a desk at the current and previous location of the Startup Port. It's a great location right in the city center of Rotterdam and has a train and subway station nearby. I always loved that the space has a lot of free facilities like printing, coffee, open kitchen, meeting rooms, rooftop and game consoles! I have met a lot of other founders through the community who I learned a lot from and are always available to talk about ideas or ask advice from. One of them even turned out to be my future co-founder of my current startup. Thanks Ralph, we are looking forward to your inevitable success! "Great space, very comfortable to work and great people"
Awesome location, right by the station, a very relaxed atmosphere and great people to hang out with. The space is well equipped with nice desks as well as an open space which is light, filled with lots of plants and a large bench + tables which is great for switching it up a bit from always having to sit at a desk. The outside space is great to get much needed fresh air. If you need anything Leon is always there to help you out. Food is always openly accessible, and you can whip up a nice lunch with the other port members. The meeting rooms have writable tables which is very handy for meetings. in the weekends there are often events which are great to attend if you're looking to expand your knowledge or meet other entrepreneurs. All in all just a great place to work! Thanks Thomas, actually only you have the skills to whip up a nice lunch, we can barely prepare decent lunches. Come back and make us a salad soon? 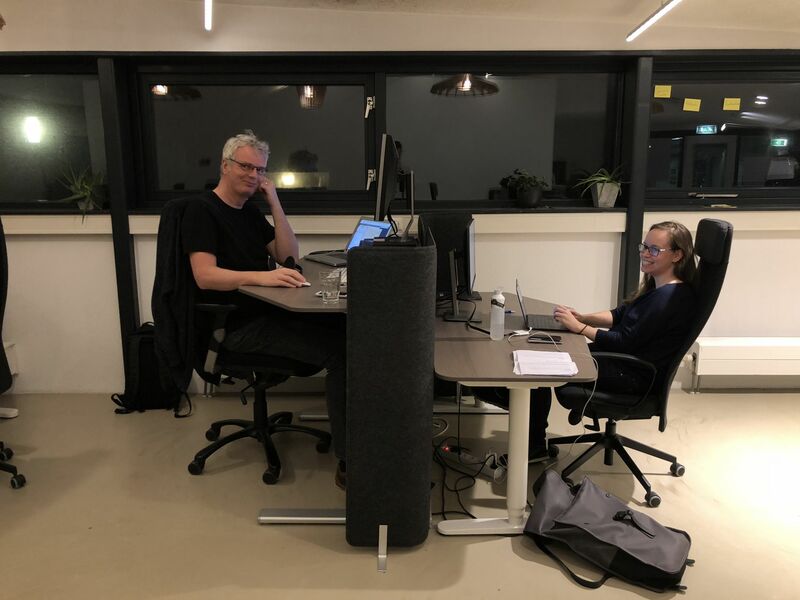 "Quiet and cozy space to work on startup ideas"
Startup Port has turned out to be a very convenient space in the coolest city in the Netherlands. Quiet enough place to stay focused and cozy enough to not be an ordinary office. The place is easily accessible with basically everything: car, train, subway, water taxi .. you name it. There are desks, but you can also work downstairs in a more living-room-alike environment. Dimmed lights and plants makes you feel at home, while the startup books reminds you where you came for. Great people work here that are always up for sharing ideas and providing feedback. Coffee and lunch is included. And to top it all off; owner Leon provides cocktails when there is reason for a party. Thanks Maurits! FYI: I can also make a cocktail for when you want to forget something. Although I’m not an entrepreneur (I work for a start up company), I feel at home at Startup Port Rotterdam. The office is filled with great people from whom you can learn a lot from. It has a cozy, comfy vibe to it, all the while still being a productive workspace. If you’d like to work on a big comfy couch where the sun is always shining, if you’d like to be surrounded by beautiful plants, if you’d like to sit at a desk or work from a meeting room, then Startup Port is the place for you. There’s always good food available (AH comes by every Monday morning) and the city center is just a couple of minutes away. On Fridays you’re always welcome to enjoy a drink or 2, including delicious cocktails, and various snacks. 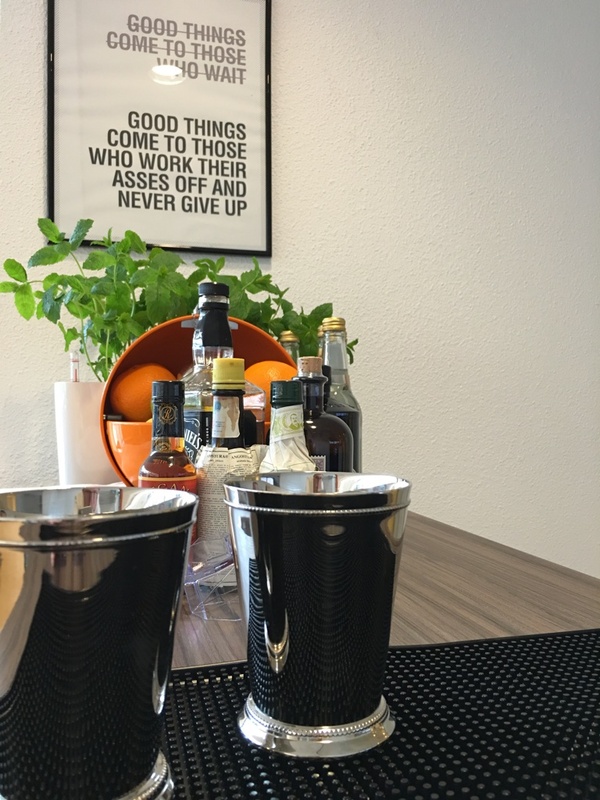 Startup Port simply is a great place to work at… and I’m not just saying that because of the coffee. Thanks Lina! What kind of effect does coffee have on you? "A home for startups and entrepreneurs"
This office has, besides an excellent location in the middle of Rotterdam, all you need as a startup. The startup community there will make you feel right at home. There is great coffee and lunch, but most of all: a great bunch of fellow entrepreneurial-minded people, who love to share their knowledge with you. Another perk is that this location is also host to several events from the Startup Foundation that help you get to know the startup community better. And the best-kept secret of this office space besides the cool people? It's roof terrace, where you can work or chill when the sun's out. 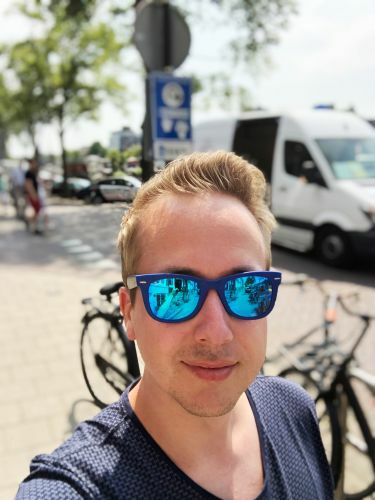 "Very friendly and enthusiastic people that actually want to help you"
I'm one of the newest (and also best) additions to Startup Port Rotterdam. When I began working at Startup Port my startup, which focuses on the real estate market, was in search of the key to a valley of dreams. And through a combination of workshops, personal interaction with other founders and extremely helpful advice I was able to develop my platform. I've worked at HIG (Het Industrie Gebouw), HNK (Het Nieuwe Kantoor) and GHG (Groothandelsgebouw) before. And I can tell you that Startup Port offers by far the best experience. Great (free) food and coffee and amazing people you can actually learn from. Thanks Martijn, you are indeed the best, you are great, you are magnificent. We hope you are enjoying your holiday! "Quality knowledge and no BS attitude "
Besides all the amazing amenities and a central location in Rotterdam, what I value most are members' portfolios of experience and the supportive culture, facilitated by Leon Pals. 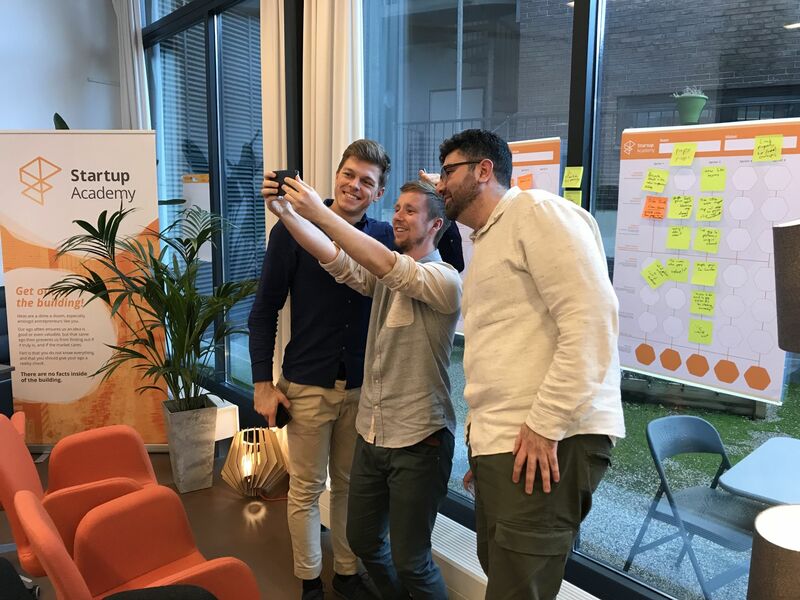 Startup Port is a hub for doers - people with concrete projects, valuable skillsets and a burning desire to provide value to their customers and peers. 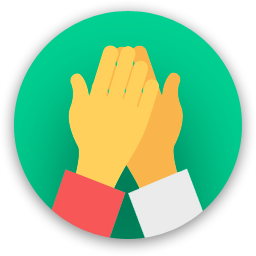 Being part of the SP community has been instrumental for experimentQ, from access to valuable reading resources to software deals, peer feedback on Slack and quality events. I strongly recommend Startup Port to everyone who needs focus and accountability on their path to create measurable results. Thanks Tudor, see you soon? 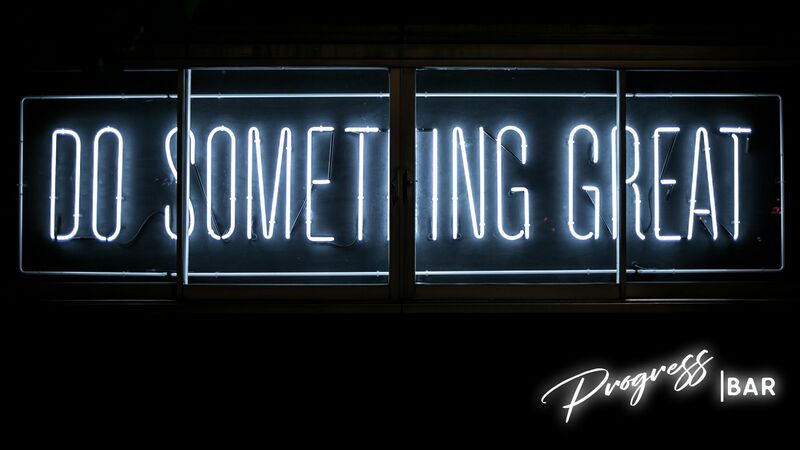 "It's like Jesus came back to Earth and created a coworking space"
Imagine a world... in which everything you ever imagined to be possible was made possible. That's what Startup Port is. Now, although after months of begging we still do not have a slide that goes down the stairs, this environment is still great to just work on your biggest entrepreneurial goals. Apple, Amazon, and Google all started in garages, the Startup Port is the modern-day garage where these companies are started. The supreme leader of the community, Leon, is one of the nicest and most knowledgeable people in the community - hence the title of this review. His business knowledge, combined with his exceptional enthusiasm for interesting companies, is a refreshing wind in the world of coworking spaces. Here, at the Startup Port, you don't just work because you work. You work for a greater cause, to make a big impact on society, to truly change the world and form it into something you would like to see. If Gandhi was still alive, I believe he would be working at this coworking space. If I had to summarize the whole environment of the Startup Port in one sentence, I would have a hard time to do so. I don't believe there are enough words in the dictionary to give an appropriate image of what you can truly expect from working here. Every single day, the community helps you push forward, to break out of your own comfort zone, to break through the barrières you never realized you have set for yourself. It's like business on steroids, without the steroids - though if Arnold Schwarzenegger would start a company I bet he would start it here. The coffee's pretty decent too. Thanks Frank! We're not sure how this impact us SEO wise, but thanks for the lolz! "A very pleasant and relaxed shared office"
The perfect balance between a quiet, productive office environment and a cozy, relaxed living space. You can sit on the big couch downstairs, choose a spot on a desk or even take your laptop and work from the terrace if the weather allows it. 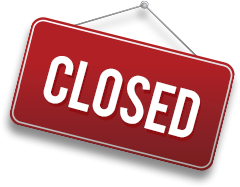 Two closed meeting rooms are available if you need to discuss with clients or handle a phone call. Fancy anything specific for lunch? Just write a note on our shared calendar and it will come with the rest of the groceries next Monday. Air frier, rice cooker, microwave, egg cooker and toast machine will help you prepare your perfect lunch. In alternative, you can walk 5 minutes and choose a restaurant in the Blaak / Markthal area, plenty of choice. You are welcome to stay for a drink on Friday evening, bitterballen included. Thanks Isa! Can you stop doing business trips though? We kind of miss having you around. For me, a one-man business, working alone from home is boring, so early on I decided that I wanted some more liveliness around me besides a buzzing home fridge. 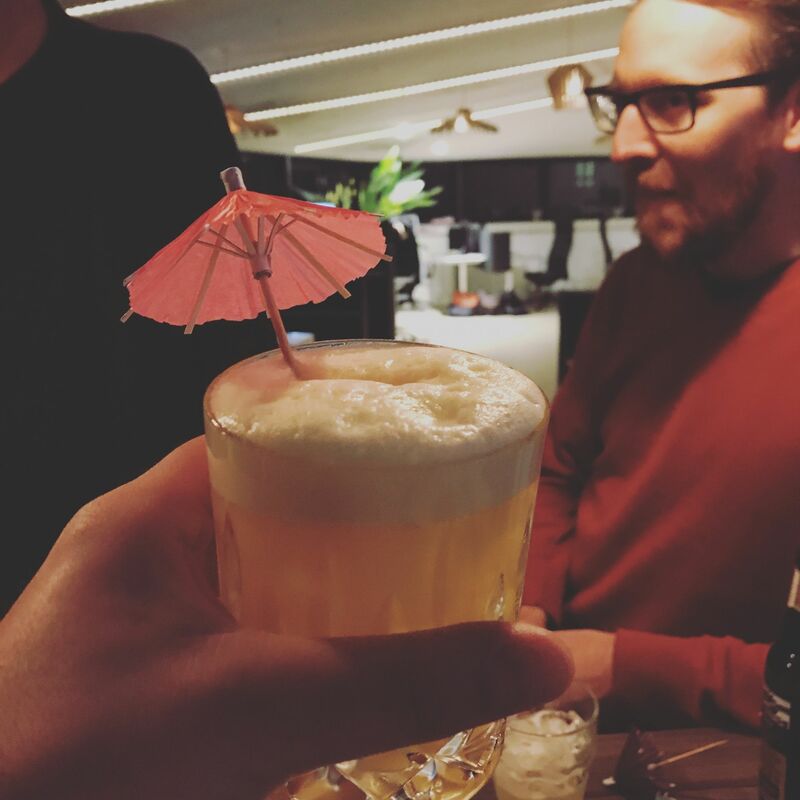 The startup port is my 6th office in Rotterdam, so you could say I'm an office connaisseur, but I'm not telling you you should. Anyway, this office is by FAR the best office I've had. It boasts a spacious feel, there's plenty of room and options to find a comfy place to work. If the weather is nice, you can sit out on the terrace (It's big!). There's two meeting rooms which you can use for calls or meetings. There's a fridge, stuffed with groceries. If you're interested in food, you can help decide what to put in the fridge. For me, that means karnemelk & orangejuice and an occasional pot of tostiquick sauce. Don't let this deter you, please. For others, it means all kinds of weird bbq sauce, green olives, root beer, grilled chicken slices or veggies. There's also a second fridge Yes sir! Wonderful. I could yammer on about the food culture in this office space, but there's other important plusses, so let's move on. The place is clean! How do you like that? Temperature management is pretty decent: In summer, the place doesn't heat up like the dog next door, and in winter, you definately don't have to huddle up to your office-companions to keep warm. The location is just super. 5 min walk to Rotterdam Blaak, markthal, or to a stunning view on the river Maas. So the question is.... why aren't you here? Thanks Gerard! Do let us know if there's anything that we can do better! 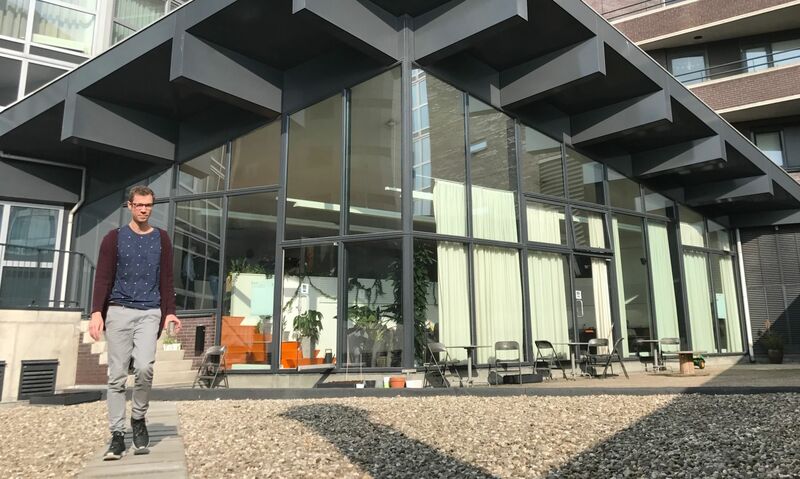 "A hidden treasure in the centre of Rotterdam"
The startup port is an amazing co-working space in Rotterdam which is quite unknown by the big audience. I moved here a while ago an loved going to this workplace ever since. The place offers a chill vibe, the people are relaxed and there is enough space for everyone. Besides that I like the quality of the desks, WIFI connection and the chairs. For lunch there is a big stock of all sorts of food which is bought fresh weekly, this is all including the renting fee which is great. On Friday's we like to put on some music and enjoy a cold beer or a refreshing cocktail. I would highly advice this working space for who prefer a cool, chilled working space. Thanks Mark! You did not love going to work pre-Progress Bar? I'm glad we could make that difference! "I might be a bit biased, but..."
We're collectively building the perfect office for us internet and startup entrepreneurs. As a member I enjoy coming in to our small hub of inspiration and hustle. Sure I also pay the bills around here, so please don't take my word for it. Come check for yourself, and if you feel our space isn't up to par, let me know and together we'll make sure it is. As that's how it works around here. Our space literally has everything you might need, and zero surcharges to boot. 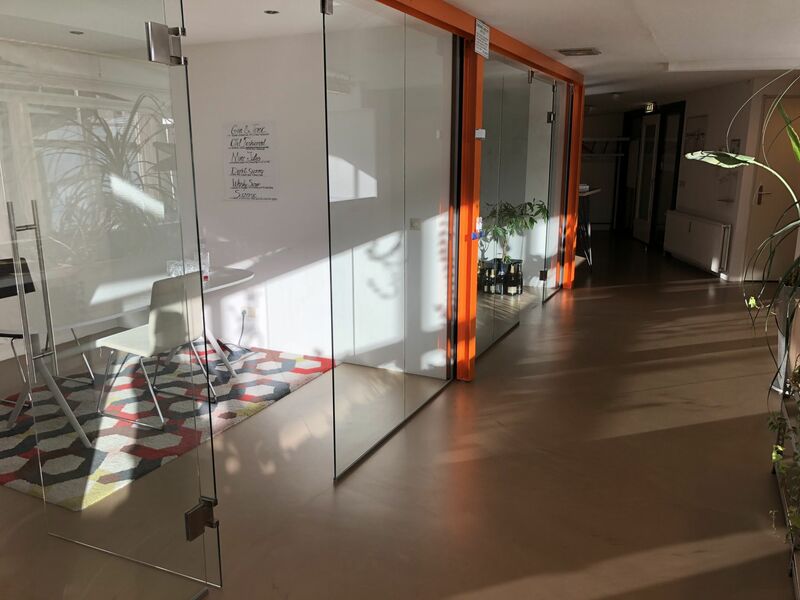 Apart from our work area, our spaces range from free meeting rooms, to a workshop space/living area, a storage room, a rooftop terrace, to a kitchen with grill and fryer. And then there's everything, from printers, gaming consoles, to multiple 4k screens to present on. Progress Bar is only a 5 minute walk from Blaak station & the Markhal where you can pick up endless assortment of foods. there is a hammock on the roof terrace! Check out the markthal for a great selection of food! 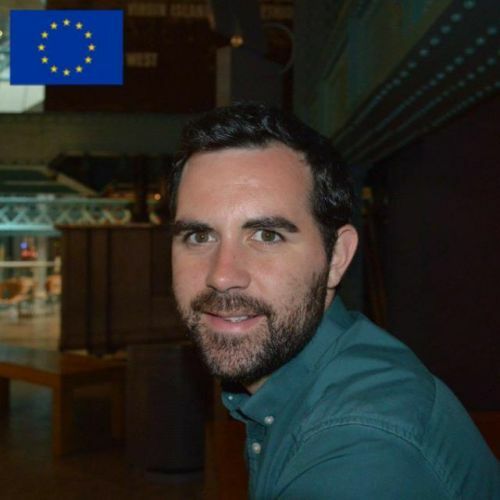 Get a meeting with Leon, the coordinator, who will for sure help you to find your way. Also enjoy the many useful books for start-ups, management etc. that are lying around. Ask Leon about attending some of the Startup Foundation events! Go for a drink at the hotel bar in Nhow for a great view over the city. For a change of scenery and lunch diversity, you can always take a stroll to the Markthal, or de Witte de With which are both a 5 minute walk. Progress Bar Rotterdam will be in touch with you soon to confirm. 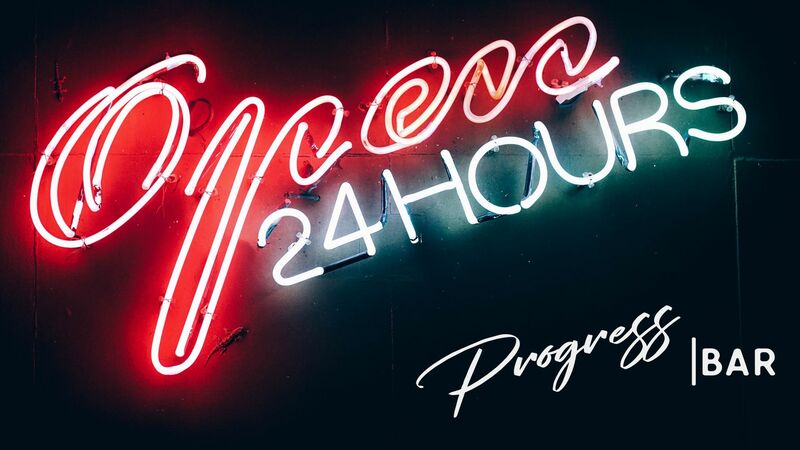 Progress Bar Rotterdam has received your membership enquiry and will be in touch with you soon.